How lithium-ion (Li-ion) batteries behave under short-circuit conditions can now be examined using a new approach developed by a UCL-led team to help improve reliability and safety. The use of high energy density Li-ion batteries is ubiquitous - from powering portable electronics to providing grid-scale storage - but defects can lead to overheating and explosions. Although catastrophic failure is extremely rare, recent high-profile cases including the recall of Samsung's Galaxy Note 7 smartphone line and the grounding of an aircraft fleet highlight why it's important to understand battery failure. "In previous work, we've tracked Li-ion battery failure caused by extreme heat in 3D and real-time, but this is the first time we've tracked what happens to the temperature and structure of cells when we short circuit the battery in a controlled way at an internal location of our choosing, initiating a series of potentially dangerous events," explained first author, Dr Donal Finegan (UCL, NASA and NREL). "This is of particular interest, as short-circuiting is thought to be responsible for a number of high-profile, real world failures. Knowing when and where the cell will fail has allowed us to characterise what happens during catastrophic failure in-depth using high-speed X-ray imaging. This provides us with new insights to help guide the design and development of safer and more reliable Li-ion batteries." The study published today in Energy and Environmental Science involved researchers from UCL, NASA-Johnson Space Center (USA), the U.S. Department of Energy's National Renewable Energy Laboratory (NREL, USA), WMG at the University of Warwick, Diamond Light Source (UK), The European Synchrotron (ESRF, France) and the National Physical Laboratory (NPL, UK). To induce failure, the team inserted a device capable of generating an internal short circuit on-demand and at a pre-determined location into commercially available Li-ion batteries, which are commonly used to power portable electronics and electric vehicles. Designed and patented by U.S. researchers Dr Eric Darcy (NASA) and Matthew Keyser (NREL), the temperature-activated device allows researchers to mimic hidden defects that can occur during the battery manufacturing processes, leading to a dangerous chain reaction of heat generation and battery failure. The team used the device to gain insight into cell design vulnerabilities by causing cell walls to rupture or cells to burst open. Using high-speed X-ray imaging, researchers monitored what happened to the structure of the cells in real-time, as the short circuit drove the catastrophic failure process which propagated through cells and modules. Individual cells, as well as small cell modules, were tested under conditions that represented a worst-case battery failure scenario. Short circuits were initiated inside the batteries at ~60 degrees C. During the failure process, cell temperatures reached in excess of 1085 degrees C.
From analysing the high-speed imaging frame by frame, the team looked at the effects of gas pockets forming, venting and increasing temperatures on the layers inside two distinct commercial Li-ion batteries and identified consistent failure mechanisms. 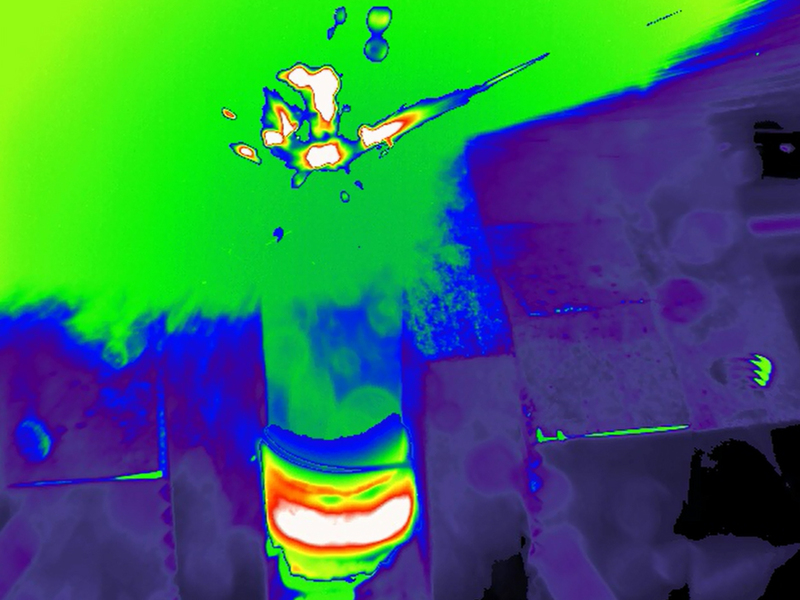 Corresponding author, Dr Paul Shearing (UCL Chemical Engineering) explained: "It is fascinating to see how quickly the process of thermal runaway can spread throughout these cells, which went from being completely intact to being completely destroyed within around one second. "This investigation provides the first description of how short-circuit failure propagates inside a cell in real time, this was only possible by combining the novel short-circuiting devices developed by NASA and NREL with ultra high-speed X-ray imaging. We were surprised to learn how susceptible neighbouring cells are to propagation of thermal runaway. This demonstrates the importance of isolating failing cells within larger battery packs and modules, which may be found in a range of applications from space suits to electric vehicles." The team now plans to examine how these new insights can be used to improve the safety of commercial battery and module designs. For example, researchers will study how the rupture of the highest energy density commercial cells can be prevented and how to reduce the risk of cell-to-cell propagation. The research was funded by the Engineering and Physical Sciences Research Council, the Royal Academy of Engineering and the National Measurement System. The experiments were performed at the ESRF and Diamond Light Source.